The artist JMW Turner had a habit of tipping his hat to the north. If anyone asked why, he would explain that the skies of Northumberland had made him famous, so he never lost an opportunity to give his thanks. Turner wasn’t the only artist left reaching for the oils after being inspired by the lure of Northumberland’s light, its big spaces and skies and dramatic ruins. Still a mecca for artists today, Berwick upon Tweed was immortalised in paintings by LS Lowry. Capturing a precious record of bygone days, the Ashington Group’s Pitman Painters also inspired playwright Lee Hall to turn their evocative stories into a Broadway production. Stare at striking sculptures, like the UK’s first permanent offshore sculpture Couple at Newbiggin-by-the-Sea. 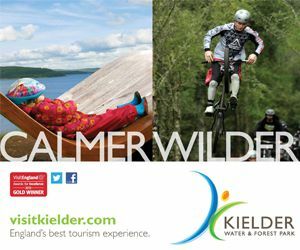 The natural surroundings of Kielder Water & Forest Park set off modern art and architectural works from world-renowned artists. The darling of many a moviemaker, Northumberland has played a starring role in countless film and television shows. Alnwick Castle acted as Hogwarts in the Harry Potter films of JK Rowling’s boy wizard. More recently Colin Firth and Nicole Kidman filmed on Holy Island and in Berwick-upon-Tweed for the Hollywood blockbuster, The Railway Man. Northumberland has captivated writers too, including William Shakespeare who immortalised Warkworth Castle in Henry IV Part I. Culture vultures can indulge their artistic passion and marvel at exhibitions, art tours and events taking place throughout the year.